ArborCare uses only non-toxic products for control of these pests. Applications start early sspring. Call now for a free estimate!!! 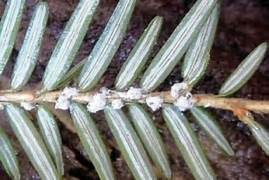 In North America, hemlock woolly adelgid is parthenogenetic (only females occur, reproducing without males) and produces two generations a year. One, the sistens, is wingless, hatches in late spring, overwinters, and survives about nine months. The other, the progrediens, hatches in early spring, is comprised of both wingless and winged (sexupara) offspring, and survives for about three months. Sexupara fly from hemlock in search of a species of spruce (Picea) on which to deposit eggs (Fig. 3). However, a suitable species of spruce is not present in North America, so this portion of the populatin dies before sexual reproduction occurs. The lifecycle of HWA promotes a rapid increase in population (Fig. 3). 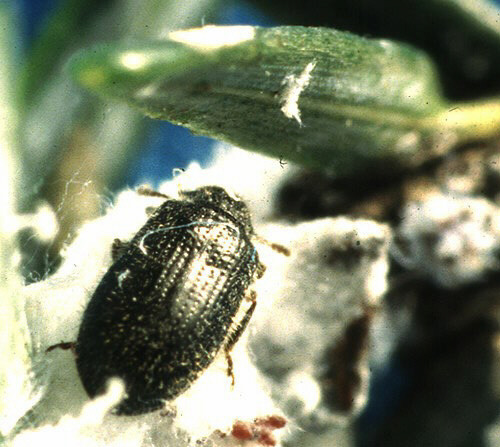 Shortly after the sistens eggs hatch, the first instar nymphs relocate to the bases of needles and immediately become dormant (aestivation). As temperatures cool in the fall, the sistens nymphs break dormancy and begin to feed and develop throughout the winter when temperatures are moderate. Adults begin to lay eggs in March – earlier in southern states or during mild winters. 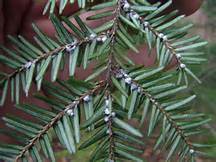 During late fall and early spring, few natural enemies are active and hemlocks produce abundant quantities of sugar and amino acids, which provide good nutrition in the twigs where adelgids feed. This results in a high level of egg production. A single sistens female typically lays between 50 and 175 eggs Hemlock woolly adelgid annual life cycle on hemlock in North America. Figure 3. 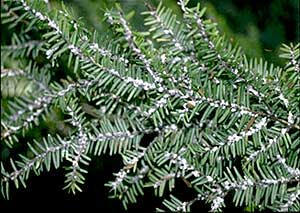 Hemlock woolly adelgid annual life cycle on hemlock in North America. (as many as 300 eggs have been observed) (McClure et al. 2001). The progrediens generation lays fewer eggs, typically between 25 and 125, but offspring mature rapidly after hatching. Egg production in early spring and again in early summer has a multiplier effect on the population, which if unchecked by natural enemies or other factors results in exponential population growth. Hemlock woolly adelgid feeding on Carolina hemlock and Canadian hemlock causes the needles to desiccate (dry up) and the buds to stop growing. Within a few months of heavy infestation, the tree looks grayish green, needles begin to drop off, and little or no new foliage is produced. Foliage loss and dieback of major limbs become visible in 2 to 4 years. An infested hemlock may survive for many years, but its foliage is usually sparse at the branch tips and very top of the crown. Weakened trees often succumb to diseases and attacks from other insects, such as elongate hemlock scale and are easily broken and thrown by wind.